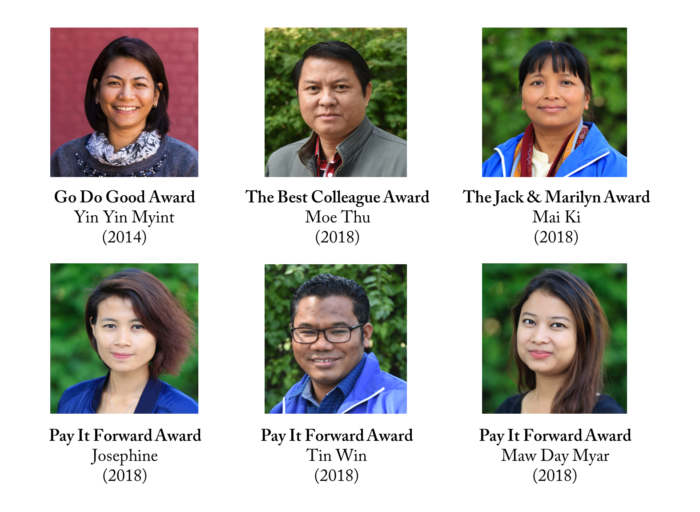 Go Do Good Award is a new award and recognizes the Fellow who has given outstanding service to Myanmar and the DeBoer Fellowship after graduation. This year’s winner first participated as a 2014 Fellow, and since then has served as an Alumni Council Member, Facilitator, Mentor, Graduation MC, and volunteered to assist several Go Do Good Projects of other Alumni. The award is presented to Yin Yin Myint. The Best Colleague Award recognizes the Fellow who leads by example, who stands out by encouraging other Fellows, is quick to engage and is a positive influence on others. The award is given to Moe Thu. The Jack & Marilyn DeBoer Award recognizes the Fellow who most embodies DeBoer Fellowship values, of excellence, service, respect, collaboration, and growth. While all our 2018 Fellows embody these values we would like to recognize one Fellow in particular. This year it is rewarded to Mai Ki. Pay It Forward Awards recognizes the Fellow who are committed to share others what they learned from the Fellowship. Fellows received the trainings from the Fellowship and provide the same instruction to their co-workers, organizations and communities. While all Fellows do Pay it Forward workshops, three went over the top in their effort to train others. The awards are given to Josephine, Maw Day Myar and Tin Win. Congratulation for fellowship award winners. I am interested this program. My friend have been shared her experience in learning of this program. I do also love to join one day if I do have a chance. When you call application, please kindly let me know.